I love pureformulas for the great prices and fast delivery. The one product we use primarily to help Digest Fat! Lifesaver. Better digestion of fats with Lipase Concentrate-HP. 2 with each meal. The inability to properly digest fats can lead to a variety of different problems. Your body needs to absorb a certain amount of fat in order to function properly; when this doesn’t happen‚ you may develop chronic diarrhea or bloating. Diet is often responsible for an inability to digest fats‚ but it can sometimes be related to certain health problems. No matter what the cause is‚ you need to find a solution to the problem. If you think that your body may not be digesting fats properly‚ you should speak to a medical professional. Your doctor can help you determine whether or not you have problems with fat digestion. You can also discuss the use of a supplement like Integrative Therapeutics’ Lipase Concentrate-HP as a possible option. 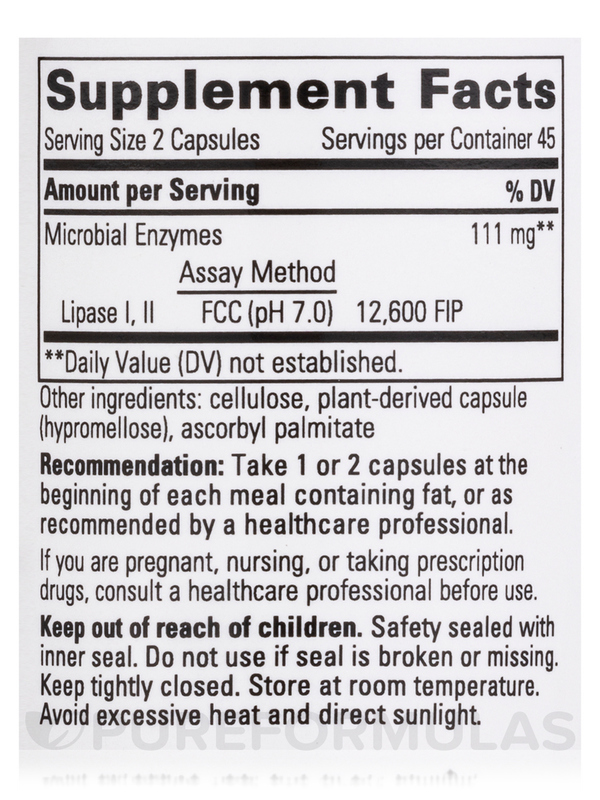 This safe and gentle formula provides a variety of plant enzymes that occur naturally in food and aid in the digestive process‚ as well as lipase I and lipase II; both types of lipase are enzymes that help your body digest fats (lipids) effectively. If taken as directed‚ one bottle of Lipase Concentrate-HP vegetarian capsules should last for at least one month. The recommended dosage is one to two UltraCaps before each meal that contains fat. Other Ingredients: Cellulose‚ hydroxypropyl methylcellulose (vegetable capsule)‚ ascorbyl palmitate. Contains no sugar‚ salt‚ yeast‚ wheat‚ gluten‚ soy‚ dairy products‚ artificial colors‚ flavors‚ preservatives or ingredients of animal origin. 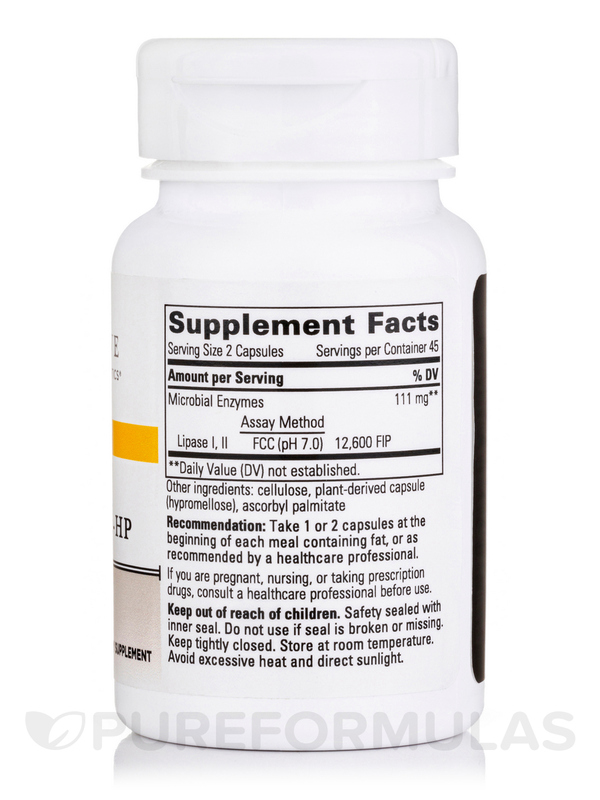 Take 1 or 2 capsules at the beginning of each meal containing fat‚ or as recommended by your healthcare professional. If pregnant‚ nursing or taking prescription drugs‚ consult your healthcare professional before use. This helps me digest fats. If I pig out on junk food...cheese, chocolate, etc. 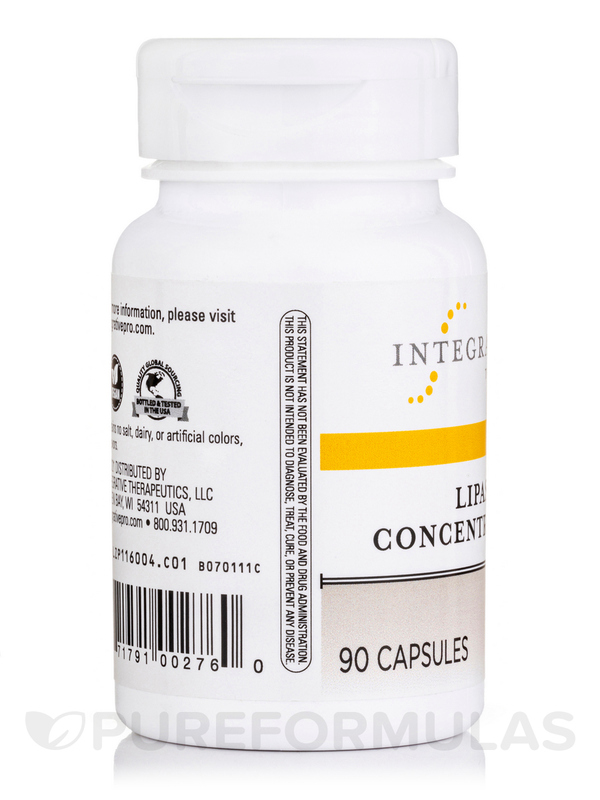 I used to have morning diarrhea every day, but this Lipase Concentrate-HP by Integrative Therapeutics has stopped it. Amazing. I don't feel so bloated after taking Lipase Concentrate-HP by Integrative Therapeutics. My doc told me to take Lipase Concentrate HP by Integrative Therapeutics based on a stool test and so I did. I heard elbows being rough and dry had to do with not getting enough fat. But I have plenty of fat in my diet. When I started taking this, I could tell I was absorbing fat better because my elbows are no longer rough, like a mountain man's. :-) I haven't changed the amount of fat in my diet at all. I have noticed that I've put on more weight though since I started this. However, I'm going through menopause, I'm 5'4" and about 105 lbs. I think it's normal to gain a little weight at my age so I'm not that concerned about it. Plus my doc has been telling me to gain weight anyways. It helps me absorb fats. Lipase Concentrate HP by Integrative Therapeutics is really helpful for digesting fats - it's greatly reduced my bloating and stomach upset from eating foods that are higher in fats (e.g. nuts, butter). I've been taking it for the past few years, and I take 2 capsules with each meal. Each capsule is very small and easy to swallow. Gotta Have It! And Difficult to Find! Trust Pure Formulas to carry a hard-to-find but essential fat absorbing enzyme, lipase. Living without a colon with only nine feet of small gut, I need lipase to breakdown and assimilate good fats. And now I have a source for Lipase Concentrate HP by Integrative Therapeutics! Should have started with pureformulas.com in the first place. It works as promised, although I need just one-sixth of the recommended dose. Afforded us a 90% savings compared to Creon. 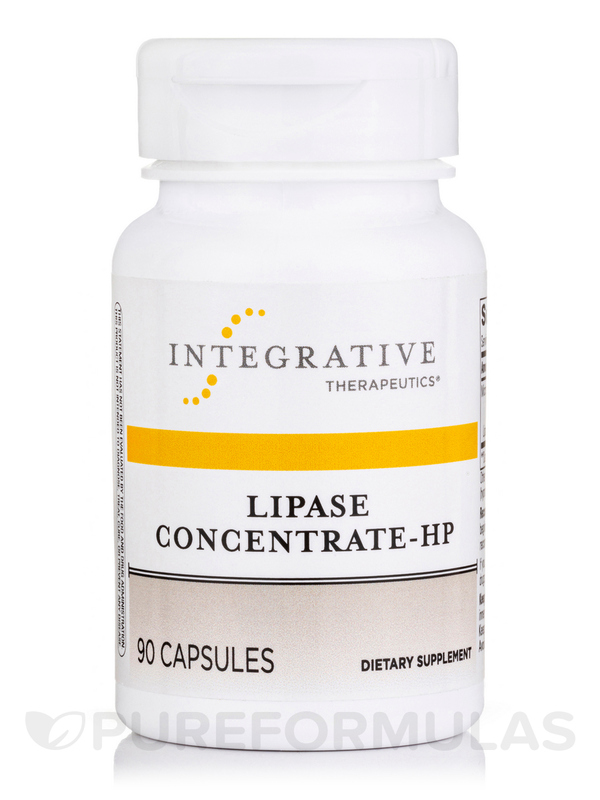 Lipase Concentrate HP by Integrative Therapeutics contains the same amount of Lipase and does not require a prescription. It is the real thing!! Take Lipase Concentrate HP by Integrative Therapeutics before I eat fat to avoid pain from gall stones. Seems to have helped so far! 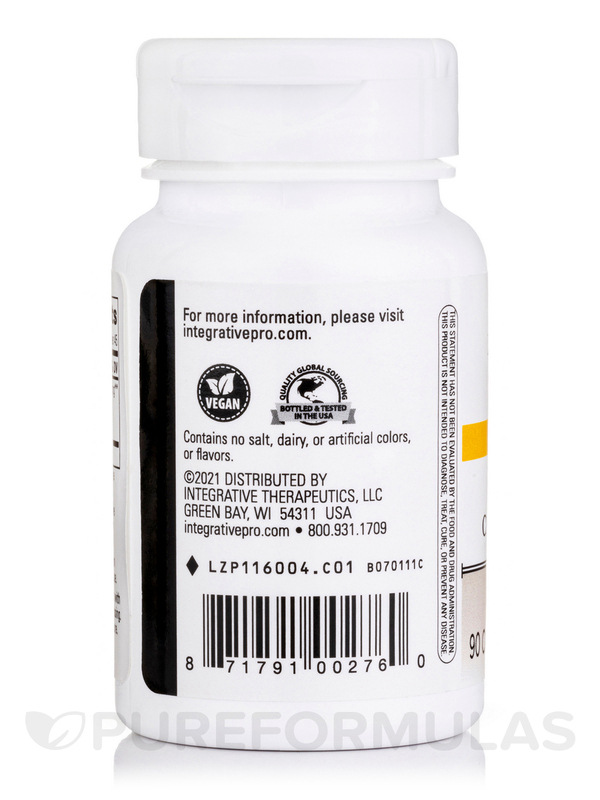 I do not digest fat so I take 1-4 of Lipase Concentrate HP by Integrative Therapeutics capsules when eating food containing fat. Works well to reduce bloating. Can get expensive if you need them every meal every day. Is this totally vegetarian? When I clicked 'Vegetarian' on the left on the page for 'lipase', this one did NOT show up! Hi Gretchen, thank you for your inquiry. On our website it is listed as Vegetarian.